Beerbrain asked the Answer Line forum about a mouse cursor that automatically moves to the Yes button when a dialog box opens. Normally, opening a dialog box does nothing to the mouse cursor. You have to drag the mouse manually to the box. But Windows doesn't have to behave that way. With the one-time change of a setting, every time a dialog box opens, the mouse cursor will automatically jump to the default button--usually Yes or OK. Some people find this handy. Others find it annoying. Still others, who never intentionally changed this setting (perhaps someone else changed it for them) find it annoying and bewildering. 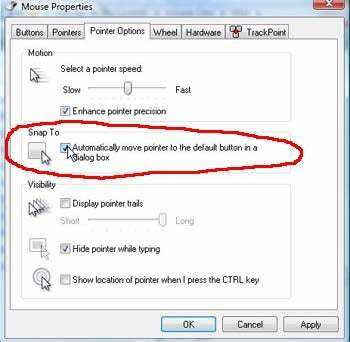 To turn this mouse jumping on or off, click Start, then Run (you don't have to click Run in Vista), type main.cpl, and press ENTER. Click the Pointer Options tab. Depending on what you want, either check or uncheck Automatically move pointer to the default button in a dialog box. My thanks to crazy4laptops for answering Beerbrain's question in the original forum discussion.